I get no joy from gardening. Dirt under the nails just isn’t my look. But the front of our house needed work. I hate gardening. There, I’ve said it. Flame me, roll your eyes. Go ahead. I don’t care. I find zero satisfaction down on my increasingly creaky knees digging among the crawlies and worms, wearing a crazy-lady hat with a net, sprayed down with poison so I won’t get mosquito bites that swell into lumps and keep me up, scratching all night. Even the bug spray gives me a rash unless I’m careful. Long ago I learned to face it: I’m an interior designer. I bake, paint and refinish. Dirt under the nails isn’t for me. 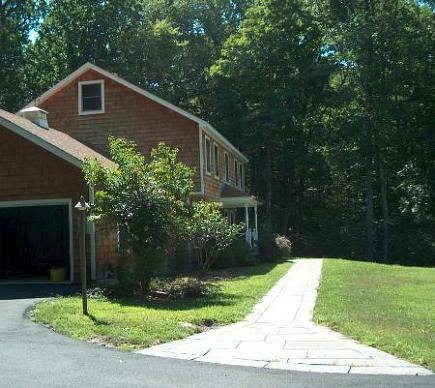 I knew I had to figure out how I wanted the front of my house to look on my own after we received the $8000 landscaping estimate for that space [top]. The landscaper, a very nice woman, was offering small plants and seemed surprised that I looked up every one on her plan. Most people don’t do that. I didn’t exactly know what I wanted (except for white hydrangeas which she said I ‘couldn’t have’) but I didn’t like anything she chose. So, like any self-respecting blogger, I turned to my magazines to find “the look” via photos that expressed basic color (not 10,000 different ones) and lowish maintenance. 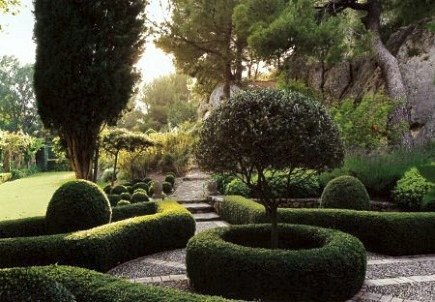 While I hate gardening as an activity, I love to look at gardens, especially those dreamy French ones with shaped boxwoods, elegant mounds and billowing clumps. I accepted that I’d need to spray to keep the evil bambis from eating the white hydrangeas and white roses (no snickers, please, I was really dumb about roses) that I settled on, along with Russian sage. In the past, I’ve shown our trees. This is the first time I’ve dared to show the evolution in the front. Things were bleak around here for some time. 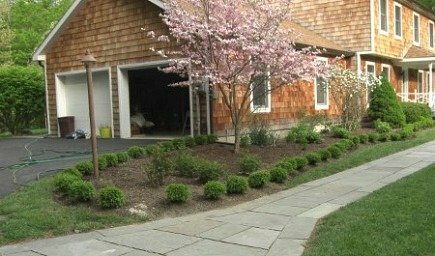 In 2005, before the entire area left of the front walkway — against the house — was converted to a flower bed, there was just a dogwood tree, the smaller viburnum between the garage and the front porch, plus some scrubby stuff and really ugly grass. We crowded the dogwood (tree on the right) by planting a rose of Sharon — a gift from my sister — much too close. I had no idea about gardening. We just dug where we could because there are gigantic rocks all over this property. This area is the first thing I saw as we came home and it looked awful. To get rid of the weeds, grass and creepers we pretty much killed everything in front and then left it that way for the better part of 2005. The viburnum, which has pretty white flowers and a fabulous fragrance in the spring when it blooms, was nicely situated between the laundry room window (right) and the garage window on the left. There was still too much grass. 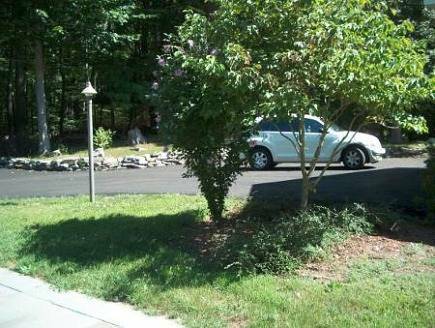 In April, 2006, I had the front bed dug out so that it meandered a bit. Both the dogwood and the viburnum were blossoming. 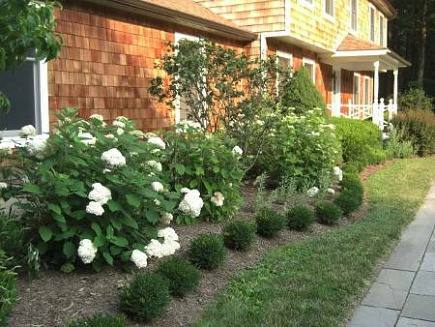 The little green mounds in the center are my white Annabelle and lacecap hydrangeas that had been planted the previous fall. I also had put in some rosebushes (the tops are the little green things in front). Meanwhile, thanks to the wonderful folks at Dripworks, I was able to install a drip watering system for about $225, which included the cost of a helper for a day. The lady landscaper had wanted $2500 for that. I had found my hydrangeas at a specialty gardening center across river and their horticulturist, David Campolong, came over to plant them for us. 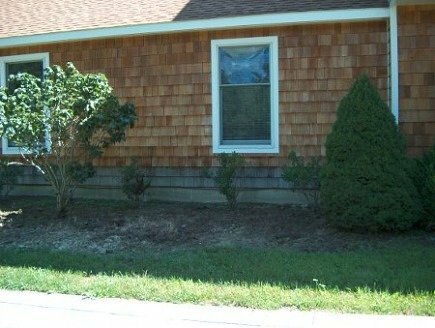 We asked him to return in 2007 and add the Japanese boxwood hedge to help better define the front bed. It was too big a job for me and since David had started his own business we were delighted to support him. (That’s David at work in the red shirt). 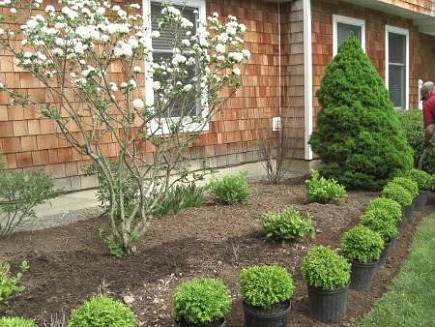 The viburnum looks a little scrawny but adding the hydrangeas and extending the boxwood was the right choice. I thought that as soon as David had finished setting them out to plant. 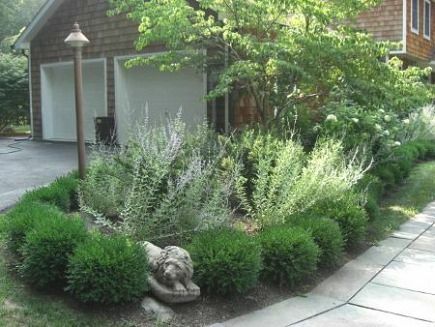 Boxwoods are usually flat and squarish but I liked the floppiness that these would develop as they grew in. See that gap right in front? That’s due to a huge boulder that could not be removed. We dug and dug but never could get around it and gave up. Those three green things in the center were the white Simplicity rosebushes I planted. Those were zone hardy but never got bushy or full enough to begin to fill in the space. I gave roses a go — adding six more bushes — because I loved having the little vases of white blooms. But there were Japanese beetles, black spot and aphids. I wanted the flowers but not the maintenance. Once I ripped out the roses, my front yard improved. It’s only taken 5 years. By deepening the planting bed we also reduced the unmanageable strip of lawn. 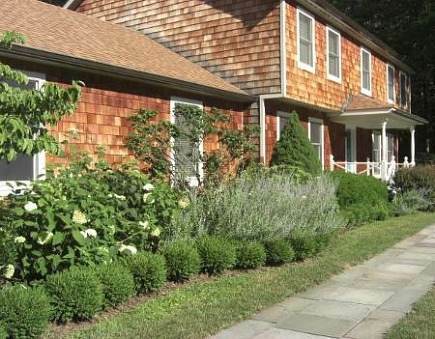 I had read that hydrangeas were not actually suited for foundation planting (in front of the house). They don’t look terrific during the winter months (and I must keep spraying because the deer will even eat frozen stems). 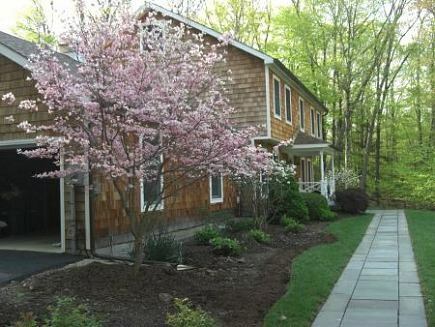 But nothing looks terrific here in the Hudson Valley during the winter except our beautiful trees. The Annabelles have been a joy. Their blooms are fist-size. Bees love the Lacecaps and they grow easily. 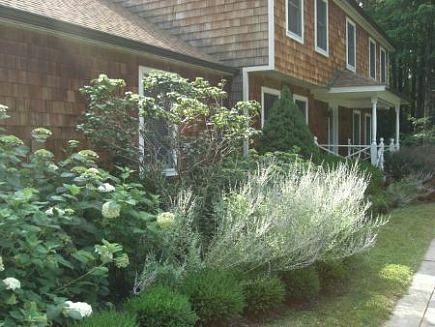 I call your attention to the wispy, pale green Russian sage plants along the bulge — those were added to get color similar to the French garden in my inspiration photo. When they bloom, the garden is edged in lavender. This summer, things are starting to look better. The twerpy Russian sage has grown tall and thick. The Annabelles are towering and the hedge is starting to fill in. Eventually, it will be a bit shaggy. We have western exposure in front and the sun-loving sage reaches out over the hedge. Now the roses are gone. I ripped them out this spring and gave them away. 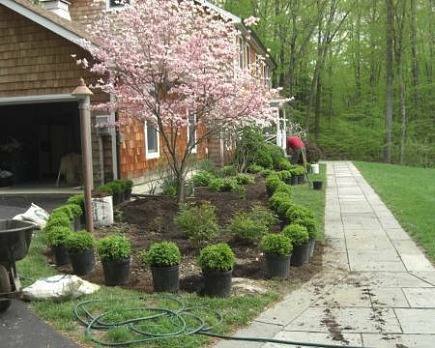 Instead, David planted low-maintenance spirea in the center. 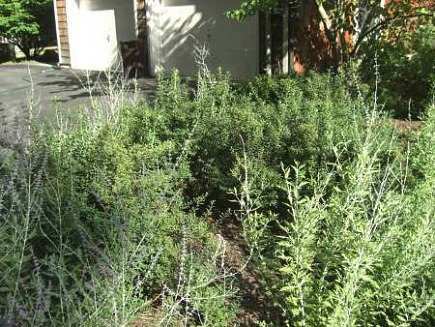 That will have white blossoms in the spring and eventually grow taller than the sage and mound over gracefully. 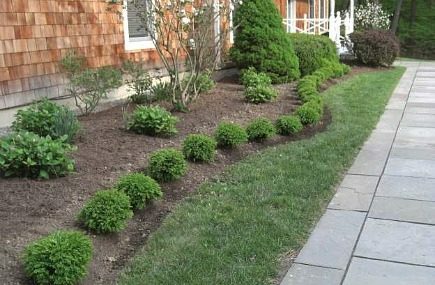 I decided to put in spirea after seeing how beautiful it looked in the gardens of several bloggers who posted their photographs. What I haven’t shown amidst all this history is the huge number and size of the weeds. Now that my front yard is looking lush at last, I know I must work to keep it that way. 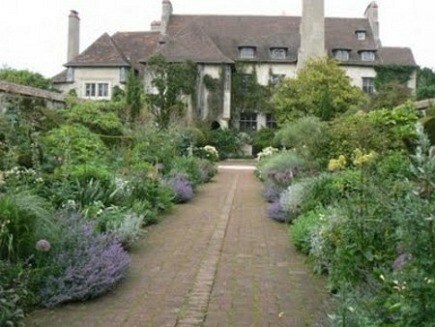 So I’ll grit my teeth and get to the gardening even though I hate weeding most of all.